The Federal shutdown and daily conflicts continuously reinforce the divisions in our country and culture, which is why a positive message of common cause and economic possibility is needed more than ever. Women entrepreneurs embody this positive message of creative energy, opportunism and community building. Of course growing a business is hard work, but the rewards are real and translate into increased household and personal wealth. Let's be inspired by the millions - 12.3 million! - of bright, determined women and their successful enterprises that contribute trillions of dollars to our local economies. This is why we are committed to the Invest in Women Entrepreneurs Initiative: we want to break down barriers that have kept women from growing their businesses. To accomplish this, however, we need to stretch outside of our normal silos to embrace new resources. We need to reflect on our own mindsets: what may be holding us back? What do we fear? Many in our network have emphasized that this is the year of the Woman, thanks to the newly elected Congress members and an apparently heightened sense of women's economic and social power. Let's take advantage of this opportunity and find new champions for women's entrepreneurship, and we mean entrepreneurs all along the spectrum - from Etsy sellers in rural regions to million dollar Women's Business Enterprises. Focusing on national survey of financing needs with WIPP: will want to publicize findings; identify and contact journalists with "women's beat"
Except from the SBA, we have been frustrated in our ability to get numbers on women and minorities from government agencies funding small business support and lending programs. Therefore, we secured the assistance of Kamala Harris’ office in getting this information. We will use this data to estimate the overall economic value obtained and frame a case for increasing investment in women. Sample Survey outcomes on What Women Want to Finance Business Growth revealed need for lines of credit and purchase order financing between $250K and $500K. We plan to conduct another survey of WBEs in California to further strengthen the data and then approach lenders - both banks and CDFIs- that have expressed interest in reaching this market of the "missing middle" women business owners, i.e., too big for micro loans and not a good fit for bank loans. Thanks to Janice Greene, CEO of WBEC-Pacific, for collaborating on our sample survey. Thanks to the advocacy of Faith Bautista and the National Diversity Coalition, Charter Communications will be investing $30 million over the next three years in CDFIs in order to make micro loans to under-served small businesses. Claudia and Faith met with Charter to advise on their planning and Carolina Martinez will be convening CDFIs in Southern CA with Charter to explore the next steps, since a good portion of this capital investment will be in California. 50% of CDFI small business loans in CA go to women, therefore this investment will result in a number of new loans to low and moderate income women entrepreneurs. Charter is to be commended for taking this innovative step by investing in our communities, and we are proud of Faith and Carolina for their stepping up to make it happen! Deb Nelson from RSF Social Innovation Fund that operates the Women's Capital Collaborative is collaborating with us on strategies to market both their investment and donation opportunities to private wealth managers. Our common objective is to have wealth managers offer these opportunities to their women clients who seek more social impact from their portfolios. Small gatherings are being organized to introduce the RSF products to wealth managers and their clients. Stay tuned for progress reports! Betsy Berkemer-Credaire, CEO of 20/20 Women on Boards has joined our Sphere of Influencers. 20/20 WOB seeks to achieve 20% women members on corporate boards by year 2020. She and her national affiliates provide training to women on how to prepare to seek corporate board appointments. Check out www.2020WOB.com if you feel called to participate in this groundbreaking movement. I-WE believes that all of our members have the chops to guide corporate boards, whose companies depend of women consumers. I-WE is preparing for meetings in Washington DC the week of March 11. Our members will advocate for capital access and gender data from government agencies serving women entrepreneurs, and will convene to explore how to increase our effectiveness on Capitol Hill. The New York Times explored the changing face of power as women boast historic gains in political power and look towards growing it further: "From these women, the message is clear: Their strength comes from collaborative, generational efforts to move toward the good . . . powerful women seem more interested in their role in improving an evolving and complex ecosystem." Grateful and Energized for 2019! The I-WE partnered with WBEC Pacific to survey women business owners about their credit needs. Based on the responses from 134 women entrepreneurs, banks are still failing to meet the needs of women who want to grow their businesses. Of those in search of financing, one-third said that they are looking for lines of credit, term loans, or equity investments in the range of $500,000 or more. The I-WE Initiative will be publishing a report soon outlining the results of this survey in greater detail. Last month we spotlighted proposed legislation, SB 1235, requiring lenders to lay out loan terms in ways that new business owners can understand. On September 30 Governor Brown signed this bipartisan bill into law, requiring those providing commercial loans to clearly disclose the borrower's total costs of financing. While the federal Truth in Lending Act similarly protects consumers, this is the first law to apply similar protections to small business owners. Congratulations to CAMEO's Carolina Martinez and Small Business Majority's Bianca Blomquist who championed this legislation, and wishing them continued success as they push for similar legislation at the federal level. Recent legislation in DC allows the SBA to finance and provide technical assistance through SBDCs to cooperatives and small businesses that are transitioning to employee ownership cooperatives. This strategy allows lower income entrepreneurs to explore ownership opportunities, and for retiring business owners to see their businesses endure. Here in the Bay Area we have Prospera which trains and supports Latina entrepreneurs who wish to start cooperatives. WBCs could embrace cooperative ventures and approach SBA for funding support for this purpose. Prospera is also is a great resource for all SBA Resource Partners, (WBCs, SBDC, etc) who would like to use their training curriculum. Claudia also participated as a sponsor in Jenny Kassan’s Fund and Fuel Your Dream conference where 50 women business owners gathered in Baltimore to learn how to successfully seek growth capital through crowdfunding. Jenny and her team offer a new platform, Crowd Fund Main Street, that both supports the funding campaign and directs investors to qualified businesses. Through this initiative they have helped clients raise millions of dollars from values-aligned investors. Thanks in part to Jenny’s pioneering work and that of Kathleen Minogue of Crowd Fund Better, a movement is gaining momentum that will fill the gap between traditional debt financing and venture capital. I-WE is proud to have both Jenny and Kathleen participating actively in the I-WE Network and fulfilling one of our goals – more funding to more women! I-WE Founder Claudia and CAMEO CEO Carolina Martinez wrote the following op-ed in recognition of the 30th anniversary of the Women's Business Ownership Act of 1988. October 25 marks the 30th anniversary of the Women’s Business Ownership Act of 1988, the landmark legislation which eliminated state laws requiring women to have a male relative co-sign a business loan, in addition to other benefits. We remember Esther Orioli, owner of Essi Systems, a successful local corporate training business in San Francisco. In 1987 she was turned down by 13 banks as she sought growth capital to meet demand for her services. Not one of them would give her the capital she needed because she was unmarried with no male relatives. She was forced to “play bank,” taking loans from friends and colleagues at 20 percent interest. She pulled it off and Essi Systems operated for another 28 years, creating dozens of jobs in San Francisco. Thirty years later, women-owned businesses number 12.3 million, according to the 2018 American Express Report on the Status of Women Owned Business. That’s 40 percent of all businesses, and 49 percent of all self-employed. Furthermore, the growth rate of women businesses has surged over the past 10 years – 58 percent as compared to 12 percent of businesses overall. These businesses create significant economic impact – 9.2 million jobs and $1.8 trillion in revenues. Yet these women entrepreneurs receive only 4 percent of bank loans and only 18 percent of Small Business Administration-guaranteed loans. As a result, an estimated 26 percent of these borrowers have migrated to online alternative lenders, who are viewed as less discriminatory. However, this is a mostly unregulated marketplace where even the most cautious business owner can get into trouble with high-cost, opaque financing deals. Let’s face it, this is a market failure which needs to be addressed. First, women need coaching and small amounts of capital in order to grow. California’s new governor should continue the current investment in Women’s Business Centers and set a new goal of doubling it. Governor Jerry Brown’s budget for this year allocated $2.4 million in funding for Women’s Business Centers (WBCs) that matches and expands funding from the SBA to provide technical assistance services. These 14 WBCs served 9,000 women entrepreneurs last year, out of a pool of approximately 1.5 million. While we’re moving in the right direction, that’s still less than 1 percent of all California women business owners. Considering the growth trends and economic value generated, California’s new governor should embrace the opportunity and set a new goal of at least double this amount. These are only examples of many organizations throughout California serving women business owners, which, just as the lenders cited above, are looking for investors and donors who see the potential in the women’s business market for strengthening our communities and local economies. Third, banks should recognize this market opportunity and step up with products and services that women entrepreneurs want and need. Traditional banks, such as Key Bank in Ohio, have created targeted programs for women. California is a leader in so many areas—we should lead on this issue, too. Women entrepreneurs are the Sleeping Goddesses of our economy. When a woman business owner is successful, she buys a house, invests in her kids’ education, and her purchases, donations and taxes circulate locally. As we watch the wealth gap widen, instead of wringing our hands, let’s invest in women entrepreneurs. It is in our self-interest to do so. When Reina Terry’s oldest daughter was preparing to leave for college, Reina felt compelled to give what she refers to as “the ole’ college speech,” urging her to follow her dreams. But Reina, who had worked as an office assistant for nearly two decades, realized that the person actually deserving of that lecture was herself. Reina knew that she had great party-organizing skills but had never taken the leap to turn her hobby into a career. “A friend from the neighborhood where I grew up (in Bayview) told me about a Women's Entrepreneurship program starting up at the Renaissance Entrepreneurship Center, and that with my talent it would be a great idea for me to come check it out,” Reina explains. She enrolled in the classes in hopes of making her dream a reality. Now, two years later, Reina is founder and CEO of PartyHapps. Reina is one of many women who are self-employed and earn a living through the “gig economy” - combining entrepreneurial efforts and contract work to make a living. Growing numbers of women are seeking out gig work to increase their income, have a flexible schedule, and find satisfaction in their work. According to a recent survey of 1,000 women in the gig economy, 44% cited flexibility as the top reason for self-employment, a reason that Reina herself gives as the defining factor in allowing her to spend time with her children without compromising her employment. Nationwide, businesses founded and run by women have increased by 58% since 2007, according to the 2018 American Express State of Women-Owned Businesses Report. But Reina is part of a particularly successful subset, Latina women, who have seen their numbers grow by an impressive 172%. Unfortunately as minority women-owned businesses have grown in number, they have shrunk in revenue, from an average of $84,100 down to $66,400. PartyHapps has given Reina more financial stability: “I have quickly learned that entrepreneurship requires multiple streams of income and that I will be able to utilize my gifts through these different avenues as long as I plan well and execute accordingly.” Reina has supplemented her income from PartyHapps with rideshare driving to stay afloat in the expensive Bay Area. Reina is now modeling the chase-your-dreams lifestyle that she wishes for her daughters, and she takes pride in her work. She hopes that more women will take the plunge and pursue their own entrepreneurial efforts, especially because supporting each other will lead to more success for all. She urges, “Surround yourself with like-minded people so that you can feed off of each others’ ambitious energies and perpetuate a challenge to become greater.” Maybe Reina has a personal stake in their success too - all of those successful women entrepreneurs will be needing help coordinating their office parties and anniversary celebrations in the future. Entrepreneurs need financing and most need it yesterday. So when an internet search offers new business owners quick ways to access small or large amount in funding, it's easy to be tempted. Last year the California Department of Business Oversight analyzed many of these alternative, online lenders, reporting that many have hidden unusually high interest rates and fees, some going as high as 300%. California State Senator Steve Glazer proposed SB 1235, a bill that requires all lenders to lay out their loan terms in a way that new business owners can understand, so that the financing costs are clear. I-WE partners CAMEO and Small Business Majority advocated for the bill. Thanks to Blanca Blomquist from Small Business Majority, and Carolina Martinez and Heidi Pickman from CAMEO for their successful efforts! The bill passed vote on Friday September 1 and now heads to the Governor's desk. Claudia and Steering Committee member Faith Bautista, CEO of the National Asian American Coalition, recently did a quick trip to DC together. While Faith met with her CDFI Advisory Council colleagues, Claudia checked in with Kathy McShane, Director of SBA's Office of Women's Business Ownership, who has agreed to keynote at Jenny Kassan's October 18 crowdfunding for women conference in Baltimore, Fund and Fuel Your Dreams. They will be celebrating the 30th Anniversary of HR 5050 that day, the legislation that created OWBO and allowed women to sign for their own loans without a male co-signer. Interestingly, women are more successful with crowdfunding campaigns than men, due in part to their need to rely on strong social networks and the persistent lack of bank financing. It's called "working it....."
Claudia also met with Candace Waterman, the new CEO of WIPP, who offered to include our questions on women's business financing needs in her annual member survey of thousands of Women Business Enterprises (WBEs). We will use this data to encourage lenders to create products to meet these needs. Candace is a dynamic leader and we are proud to have her in our Sphere of Influencers! Shout out to both Katie Vlietstra (NASE) and Barbara Robles (Federal Reserve Board) for their insights, support and connections as we build this movement. As Barbara said, "what is not measured, does not exist." Economists do not "see" self-employed, home-based, non employers as true businesses, contributing to the economy. They don't understand how these enterprises are actually creating employment through the 1099s issued to other contract workers. We at I-WE rely on the data produced by Emergent Research to balance the Bureau of Labor Statistics, and we will continue to aggregate various studies in order to shine a light on the economic impact of women businesses in this sector. Bank of America published their 2018 Women Business Owner Spotlight report, with 84% of respondents saying that access to capital for women has improved in the past decade. However 68% reported that it is more difficult for them, than for men, to secure financing. A large proportion expressed that reducing gender disparity in financing would have the most impact. This tracks with the data from the Federal Reserve's annual Survey of Women's Business Credit Needs which showed that 26% of women sought alternative financing, e.g. online lenders. It is interesting to note that 24% of those surveyed cited more education for women would help increase access to capital. This indicates the need for more business training and technical assistance. Heads up SBA Administrator Linda McMahon! In California two years ago, a million dollars in TA funding leveraged $200 million in new loans. Just imagine how many women businesses and local economies would benefit if our Women's Business Centers had more funding for this purpose. When African American women represent a tiny fraction of startup CEOs, and raising $1 million in capital is a longshot for any CEO, Anita Gardyne is truly the exception to the rule. With decades of experience in the tech world and a relentless appetite for networking, Anita has distinguished herself as one of very few women of color at the helm of a successful start-up, Oneva. Stay tuned for an upcoming I-WE feature about how Anita was able to beat the odds by obtaining this level of funding, and her advice for other women fighting the uphill battle to build a business. In Baltimore on October 18-20 Jenny Kassan, I-WE Steering Committee Member, crowdfunding maven, and author of Raise Capital on Your Own Terms: How to Fund Your Business without Selling Your Soul will be hosting a three day training on how to fund and grow your business. Gain insights into how to identify your needs, find ideal investors, and create a plan that works for you. Mention you were referred by Claudia Viek for an additional 20% discount at www.fundandfuelyourdreams.com. Turns out that the I-WE home base of San Francisco has been ranked the best city to own a business if you're a woman. Although a recent study by Dell argues otherwise. San Francisco is known for its wide-ranging assortment of creative start-ups, from funky retail shops to online purveyors, upcycled reused material creations to brand new products, solo ventures to collaborative team efforts. But rarely does a single entrepreneur manage to do it all. For Yabette Swank of SwanketySwank, she’s managed to explore every avenue of business ownership, with her latest venture building on her many years of experience. 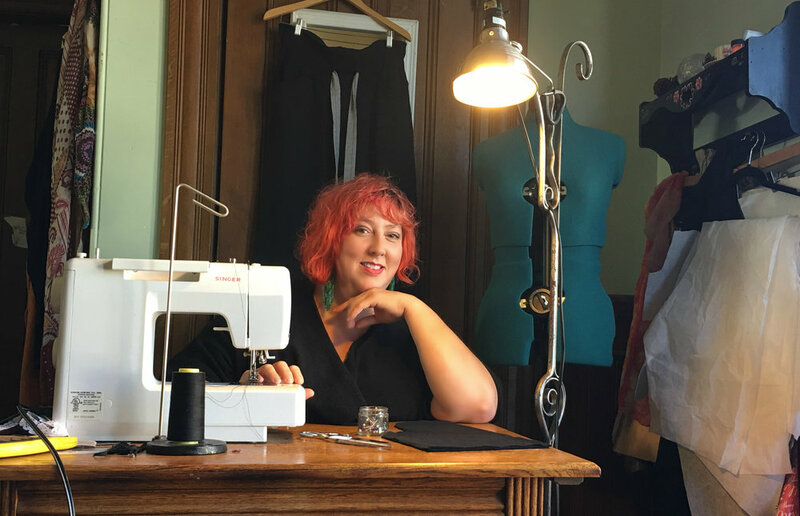 When Yabette first came to San Francisco she was an audio engineer, but the unrelenting pace of studio work led her to her first entrepreneurial effort: sewing bags that became popular enough for her to justify quitting her day job and opening a retail shop. “I started making bags that were interesting and unique but also fully functional for mamas in the city like me,” Yabette explained. She provided space for other creative types to sell their wares, building up a local artist community that supported one another’s work. After taking a class in business planning at Renaissance Entrepreneurship Center in San Francisco, Yabette reevaluated her plan and has now launched an online shop where she sells her latest creations: sustainable clothing for men and women. Yabette counts herself fortunate to have supported herself in San Francisco’s competitive economy all while switching things up and pursuing her passions. “Following my heart isn’t always the best business model," she confesses, "but I wouldn’t have it any other way! Check out Yabette’s latest designs, for women and men of all body types in styles ranging from casual to luxurious, at www.swanketyswank.com, where you can also click through to her kickstarter link to get in on the action! The Invest in Women Entrepreneurs Initiative will be hosting a lunch in San Francisco for our Sphere of Influencers to contribute to a strategic discussion to advance our I-WE goals of new funding for resources supporting women-owned business. Mark your calendars now for this Friday, June 1, 12pm-1:30pm gathering at the Renaissance Entrepreneurship Center at 275 5th St. in San Francisco. Delicious sandwiches and homemade cookies included! If you know of a talented student looking for a summer gig, please direct her to our new Summer Research Director position for the I-WE. Working remotely and receiving a $1,000 stipend, this intern will spend about 50 hours researching the landscape of government support for women-owned businesses in the US as well as the correlation between homeownership and business capital for women. These issues were identified as important by our network members at our recent lunch meeting in DC. Check out this link for details on how to apply. Locally in San Francisco, the city government is pioneering a program that offers micro-grants to women business owners who wish to expand operations, finance new projects, make improvements to facilities and create additional marketing campaigns. Read more about the new Women's Entrepreneurship Fund here. 99designs recently published the results of their survey of 3,000 entrepreneurs. Their research lays out the challenges women entrepreneurs face in raising capital, but also shows some surprising similarities in industry distribution. Read more here. Jess McGuinty didn’t dream of becoming an entrepreneur, her unmanageable hair pushed her into it. Fighting her way through wild curls, Jess found an online community of similarly tangled folks who all shared the challenge of finding products to tame their locks. Strangers quickly flocked to her when, after much trial and error, she concocted a formula for the perfect homemade hair gel. Jess knew that she could make a great product, but had no idea where to begin as a business owner. Living in Berkeley at the time, she happened upon an organization called SCORE that connected her with retired business professionals who could share their expertise. A friend offered her use of his chemistry lab to perfect the preservation of her products, and her father gave her business tips that she wasn’t too stubborn to take. Jess advises up-and-coming entrepreneurs to not let their egos get in their own way: “You haven’t done this before, so how can you be expected to know how to do it?” The resources and friends that supported her were essential to her success, and Jess points out that most communities have a Small Business Development Center where free advice and services can go a long way in setting a new business owner on the path to profit. What started in Jess’s kitchen has grown into Jessicurl, a strong business that operates out of a factory in Arcata, California. Jess takes pride in her successes (including an appearance on the Rachael Ray Show) and the excellent staff she employs, but it always comes back to her commitment to her customers. Helping them to find the products and community that enable them to love their hair and themselves is what inspires her. The Invest in Women Entrepreneurs Initiative has launched! Staffing, Steering Committee, and strategy plans are underway! Our Steering Committee is still in formation, attracting women business leaders from a diverse array of backgrounds. We seek to be bipartisan by working together across political affiliations, which will make us more effective in changing the status quo, i.e., the extraordinary lack of capital and minimal government funding for Women's Business Centers. All communities benefit when women entrepreneurs thrive! Check out our current (and growing!) list of leaders and influencers here. I-WE Influencers in Washington DC will be gathering for the first time at our lunch next week on March 7 at the lovely offices of the American Sustainable Business Council. We're looking forward to a lively session of charting out key strategies and connecting in-person with some of our talented and resourceful leaders in this cause. In California, Governor Brown has proposed significant funding ($20 million) for small business development that would include matching funds for women's business centers. We will work to direct this funding in strategic, effective ways. Already, CAMEO's new CEO Carolina Martinez is taking the lead along with Small Business Majority and other partners to shepherd this bill that will have a significant impact on women entrepreneurs. We are scheduling meetings with bank leaders who have expressed an interest in creating loan funds that are accessible to women. We will celebrate and promote the 30th Anniversary of HR 5050. Check out “Spotlight on H.R. 5050: The Bill that Changed Everything for Women Business Owners,” the white paper, published by NAWBO, reflects on the provisions that transformed the course for women business owners and highlights the current areas for improved policy and better women involvement. HR 5050 allowed women to apply for loans without a co-signer and created the SBA's Office of Women's Business Ownership that today funds over 100 Women's Business Centers, serving 145,000 women entrepreneurs annually. This is a great opportunity to yes, celebrate, but also to point out the continuing need to achieve real equity for women both in capital access and in getting business assistance resources. Time Magazine reported on Washington DC as a women-friendly counterpoint to the Silicon Valley boys' club. Profiled on our website is Judi Henderson, a small business owner who turned the chance opportunity of a warehouse full of mannequins into a successful business. Judi benefited from the Renaissance Women's Business Center in San Francisco when she was starting her business. Judi Henderson, founder of Mannequin Madness, calls herself the "accidental entrepreneur." Successfully working as an employee of large corporations, she had no intention of founding and running her own business. But after a chance encounter with a retiring business owner who specialized in mannequin sales, Judi decided to buy his whole inventory and open up a shop of her own. Like many budding women entrepreneurs, Judi faced two challenges: seeing herself as an entrepreneur and having the business skills to succeed. "I think sometimes women are loath to see themselves as entrepreneurs because there aren’t images that look like us. I never saw someone on the cover of Entrepreneur Magazine that looked like me. Women entrepreneurs were mostly involved in fashion or food. There was a lack of role models for thinking beyond those spaces." Judi had the drive and the idea, but needed the business skills to get her company off the ground. She took a class at the Renaissance Center, a resource center for entrepreneurs, which helped her design a plan. "What I originally had in mind wasn’t going to be successful, which Renaissance helped me realize. They saved me from making a costly mistake." Judi recommends to other budding entrepreneurs that they seek out similar resources to start off on the right foot. Moreover, she thinks that more women need to see themselves as business owners and more banks need to fund them. "You look at loans to women - the success rate is unbelievable. Often higher than among the men. Women are very resourceful, and they are often working on businesses that benefit the community locally and at large." She insists that banks and the government need to see that women might do business differently, but that doesn't make them a risky investment: they're highly motivated and invested in their families. While investors may be dazzled by big tech start-ups, Judi makes the point that smaller businesses are more likely to hire locally, and that even tech firms need the support of community businesses to provide services and support. For a long time Judi saw herself as a hobbyist, until her business began to take off and she realized that she had become a role model to others. "I was featured on CNN and a woman in London liked my idea. We started communicating online, and ultimately I met with her in person there, and next thing you know she was having her own entrepreneurial success." #1: Educate yourself by taking workshops, classes, and surrounding yourself with other entrepreneurs. Find support. Don’t try to do it alone. #2: Become digitally savvy. Even a low-tech business needs to use tech skills to grow, whether its having an e-commerce website or tools for running the business.